It’s used to download Multiple Image files from the clouds like Google Drive, DropBox, Firebase Storage etc. Is there any extensions for google drive like cloudinary? Is this your own extension? Yes, I made it after looking at Andres Cotes Webview Addon. 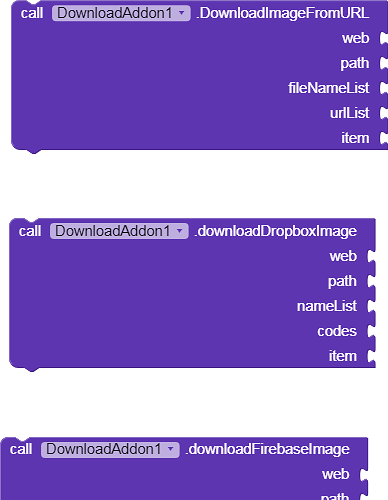 I added Firebase Function and made it compatible for multiple files. Well done. Make sure you give an props to Andres, as well can you show a couple examples of how the lists work. Maybe a little video or something? People ask about multiple assets all the time, and with your extension and with @Abhijith_Dominic most recent extension, there are some very powerful asset management tools. I would love to see how the Multiple works. can you show some examples? I am not getting how! I’ll post some examples and AIA file by tomorrow. It’s night now !! I’ll correct it in the next update !! Another thoughtful contribution. Thank you Yasir.